We adopted the National Plan for Teaching Swimming. The guide below has been written by the ASA and sets out the syllabus and its aims and objectives for the Teaching of Swimming and for pupils who follow this syllabus with us. It leads nicely into our Lifesaving programme which we promote and develop for our young adult swimmers. See our syllabus for badges. Our teachers have received training and have a good understanding of its aims and objectives. It pulls together much of what we have always valued in our teacher programme, so please ask questions once you have studied the little diagram below and had a read of the guide for parents. We will be merging this syllabus with other badge work that we still value from our existing syllabus and leading to Lifesaving in the teenage years. The National Plan for Teaching Swimming (NPTS) is an ‘all-inclusive programme’ which takes the non-swimmer from his or her first splash to developing confidence and competence in the water. The national governing body for swimming, the Amateur Swimming Association (ASA), has produced a national syllabus for Aquatics, in order to equip learn to swim providers with the training and tools to deliver a multi aquatic, multi skill programme. The Swimmer’s ‘journey through aquatics’ following the National Plan for Teaching Swimming will result in the development of a wide range of skills. These skills, if you like, are a jigsaw of pieces, and when put together result in a competent, confident and safe Swimmer who has the skill base for then developing technique in a wide range of water based sports. A child develops their basic movement range during the ages of 5 years to 8 years for females, and 6 years to 9 years for males. During this stage of ‘growing up’, children should be taking part in activity that builds their FUNdamental movement skills, with the emphasis being learning through FUN. With reference to this, children need to build up skills that fall under specific categories; in aquatics these are aquatic specific. Listed below are the main areas of skill which are developed as a Swimmer takes their journey through aquatics, following the ASA National Plan for Teaching Swimming. ENTRY – safe entry into water, use of steps, side, jumps and eventually dives. EXITS – safe exits from water, use of steps and side. BUOYANCY & BALANCE – developing an understanding of buoyancy and balance and what affects it, and how to become buoyant in the water. ROTATION & ORIENTATION – developing skills such as: how to turn around, how to lie back, how to lie forward, how to regain an upright position, and how to twist from the back to the front and vice versa. STREAMLINING – understanding of streamlining, how to be streamlined and why it is important. AQUATIC BREATHING – developing confidence in the water and a feeling of being at ease with the water around the face, learning how to breathe correctly, which consequently is developing a ‘safe’ swimmer. TRAVEL & COORDINATION – developing movement forwards, backwards, sideways, how to travel effectively, exploring different ways of travelling in water. WATER SAFETY – development of a basic understanding of how to keep safe around water. HEALTH & FITNESS – developing an understanding of why activity is good for you. If the Swimmer does not accomplish a skill such as ‘aquatic breathing’, the achievement of skills such as rotation, streamlining, travel, buoyancy and balance will become impossible to learn effectively, if at all. At each Stage of the ASA NPTS, all skills are crucial and must be comfortably achieved prior to moving on to the next Stage. Through the journey of acquiring skills, water competence will develop. Through a competence in water, the child will have more FUN, is more likely to be active and follow a healthy lifestyle, and more likely to actively participate in sport throughout their lifetime. Finally, all Swimmers’ excel at a pace individual to them. The swimmer’s ‘journey through aquatics’ starts with FOUNDATION, a programme for developing early years water confidence, which is encouraged through sessions such as ‘parent and baby’ and ‘pre-school’ sessions. The emphasis is upon development of very basic motor skills and introduction to water and the swimming environment through fun and games. The ‘Duckling’ Awards provide rewards appropriate for this section. The next stage along the ‘journey’ takes a swimmer through FUNDAMENTAL MOVEMENT SKILLS, STAGE 1 – 7 of the National Plan for Teaching Swimming. There are smaller stepping-stones for swimmers who are not yet ready for Stage 1 of the NPTS and who may have ADDITIONAL NEEDS requirements in order to progress into Stage 1 of the NPTS. The Awards range specific to this section is the ‘Alpha Awards’. (For more information regarding the content you may wish to purchase the ASA Parents Guide, available from the ASA Awards Centre, Freephone: 0800 220292. STAGE 1 – Developing basic safety awareness, the ‘class’ scenario, basic movement skills and water confidence skills. Swimmers may use aids, e.g. arm bands, floats etc. STAGE 2 – Developing safe entries to the water. To include jumping in, basic floating, travel and rotation this is done unaided to regain upright positions. Swimmers may use aids, e.g. arm bands, floats etc. STAGE 3 – Developing safe entries including submersion, travel up to 10 metres on the front and back, progress rotation skills and water safety knowledge. STAGE 4 – Developing the understanding of buoyancy through a range of skills, refining kicking technique for all strokes, and swimming 10 metres to a given standard as directed by the ASA. STAGE 5 – Developing ‘watermanship’ through sculling and treading water skills, and complete rotation, also performing all strokes to the given standard as directed by the ASA. STAGE 6 – Developing effective swimming skills including coordinated breathing; developing the water safety aspects and understanding of preparation for exercise. Once the swimmer has developed the core range of skills required to be confident, competent and safe in water through Stages 1 – 7, the swimmer may then have the choice to take part in different aquatic disciplines. FUNDAMENTAL SPORT SKILLS, STAGES 8 – 10 of the National Plan for Teaching Swimming are available in competitive swimming, water polo, synchronised swimming, and diving and lifesaving. At Aquarius Swimming Club we will endeavour to include as much of the syllabus above as we can. As a result of completing ALL the outcomes detailed within each Stage of the National Plan for Teaching Swimming, a set of awards are available, called the ‘National Plan Awards’. The Amateur Swimming Association, is the National Governing Body for Swimming in England, the disciplines include: Swimming, Diving, Water Polo, Open Water and Synchronised Swimming. The ASA organises competitions throughout England, establishes the laws of the sport and operates comprehensive certification and education programmes for teachers, coaches and officials as well as its renowned Awards Scheme. It is the ‘National syllabus’ produced by the National Governing Body for Swimming, the Amateur Swimming Association (ASA) to assist and support the delivery of swimming lessons. It is a single pathway for Swimmers to learn how to be competent and confident in the water. It is a ‘multi skill’ programme for swimmers to learn how to swim and be proficient (competent) in water for them to then make the choice to continue to participate in any aquatic sports later on… such as Competitive Swimming, Diving, Synchronised Swimming, Water Polo and Rookie Lifesaving. WHAT are the Kellogg’s Awards? Kellogg’s sponsor the ASA Awards Scheme. WHAT Awards OR Stages are included in the NPTS? The NPTS includes Foundation Phase (Adult & Child, ASA Duckling Awards), plus there is an additional phase of Alpha Awards between Foundation and NPTS Stage 1 to support adults who may not be very water confident or support for those with a disability. The Core, FUNdamental Movement skills are NPTS Stages 1 – 7. The Sport Specific Skills are the discipline specific Stages 8 – 10. 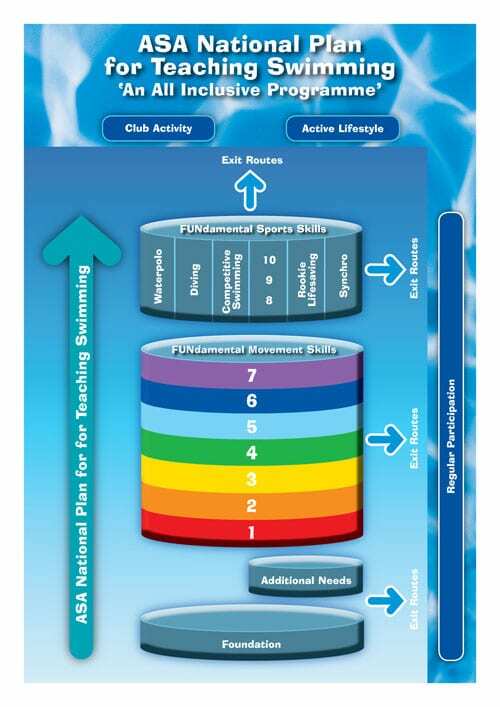 The Synergy Cylinder diagram (above) included in the NPTS Resources gives a clear overview of the pathways and how to develop the Swimmer’s journey through aquatics. WHEN does a Swimmer Achieve an Award? A Swimmer must pass ALL outcomes for that Stage before they have achieved an Award. The outcomes MUST BE performed to a standard that is stipulated by the ASA and included in the NPTS Resources. WHEN does a Swimmer move into the next Group? This will depend upon your facility. Normally Swimmers move up to the next group when they have passed an NPTS Stage. The Facility / Organisation may offer other aquatic sessions that a Swimmer may be interested in. There may be Clubs who operate in your locality, which may offer activities that Swimmers can then progress into. HOW long will it take for my child to pass each Stage? This will vary with every child. If a child has the experience of pre-school or adult and child sessions then he / she may move faster initially through the NPTS Stages 1 & 2 as they will be familiar with the environment and possibly confident in the water. WHY might Swimmers be playing Games instead of swimming widths / lengths? To learn how to swim, pupils need to master skills that will help them float, breathe and move around in the water. Through games, swimmers have FUN and learn important skills. If swimmers are having FUN they enjoy what they are doing and often learn faster. The NPTS has a multi skills approach so all the skills that are learnt lead to development of a competent and confident swimmer, who is safe and happy in the water. WHAT is LTAD and WHAT are the long-term benefits of LTAD? LTAD refers to ‘Long Term Athlete Development’. LTAD is a clear pathway of development for an Athlete, in our case ‘a Swimmer’. There are 5 stages to LTAD, and ‘Learn to Swim’ is all about FUNdamentals. >Growth is rapid due to the development of large muscle groups in a child, and therefore the emphasis should be on developing basic movement literacy and fundamental movement skills in all sports / activities. In order to develop basic movement literacy successfully, there should be participation in a wide range of activities hence the FUNdamental, multi-skill approach in delivering the NPTS syllabus.